First edition, first print hardback of LONDON OVERLOOKED Written and illustrated by Geoffrey S. Fletcher and published by Hutchinson & Co (Publishers) Ltd, London in 1964. 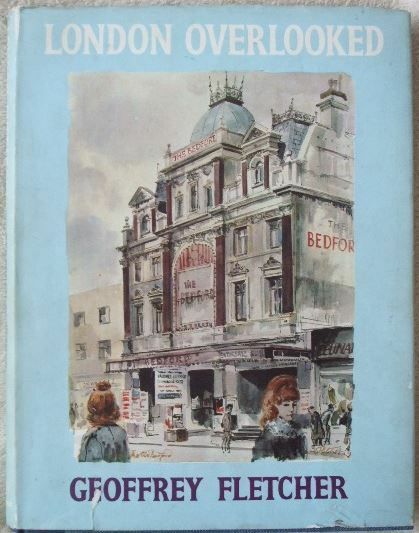 Jacket illustration shows the Old Bedford Music Hall. The book is in good condition (Clean blue speckled cloth boards with gold lettering on the spine) with slight wear to the dust jacket which is not price clipped (creasing, rubbing and chipping to the edges and corners, a half-inch closed tear to the front bottom edge, slight tanning to the spine and jacket inside. There is a very small faint stain on the front flap). Internally, the pages are clean and tight and there are no tears. DJS 687 written in small letters on the back board. There is minor tanning to the endpapers. Geoffrey Scowcroft Fletcher (1923–2004) was a British artist and art critic, and is best known for his 1962 book The London Nobody Knows - a record of an unfamiliar London at the time. Fletcher was born in Lancashire and educated at the University of London and the Slade School of Art and won a scholarship of the British School at Rome. His drawings appeared in British newspapers such as The Guardian and The Sunday Times, and he worked for The Daily Telegraph, writing and illustrating a column, from 1962 to 1990. He used this medium to promote his drawings and texts about London, focusing on such mundane sights as gas lamps, Edwardian tea rooms, cast-iron lavatories and crumbling terraces. The term 'Geoffrey Fletcher London' is used to refer to his idiosyncratic descriptions. He produced over thirty books about London. His best-known work, The London Nobody Knows, was made into a documentary film in 1967, directed by Norman Cohen and narrated by British actor James Mason. "Geoffrey Fletcher is an artist in love with his subject. The subject is London, which he has spent years exploring, sketch-book in hand, to capture every curious, changing, intimate detail of its life. His is the London overlooked by the glossy guide-books; overlooked, indeed, by many Londoners, whose untrained eyes miss the oddities and the off-beat beauties which still survive the ravages of time and the demolition gangs. The vanishing glories of the Victorian music halls, Bloomsbury squares, Hampstead and Hoxton, shop-fronts and cemeteries... Geoffrey Fletcher describes them all in a witty, informed text which perfectly complements his brilliant sketches. His previous books, his exhibitions and his drawings in the Daily Telegraph and other publications have made his tastes and talents known to a wide public. The highest expectations will not be disappointed by LONDON OVERLOOKED which spreads its net even wider than THE LONDON NOBODY KNOWS." 128 pages. Illustrated with black & white architectural sketches by Geoffrey Fletcher.